What’s the Secret to Anti-Aging Genucel Products by Chamonix? Are you looking for an easy and effective way to look younger? The Genucel line of anti-aging products by Chamonix are scientifically formulated and tested extensively on human volunteers. In other words, they have already been proven to work before they’re sold, granting a lot of consumer trust to the brand. After applying Genucel products to your face, you’ll look and feel like you’ve stepped through a time machine! In this article, we’ll explore the science behind how Genucel anti-aging products work. Think of your skin like a rubber band. Normally, a rubber band pops right back into place. However, older rubber bands do not revert to their original state the same way that newer ones do. The same is true for human skin. As we age, our skin—much like a rubber band—loses its firmness. When we’re young, we can stretch our skin out and it will spring right back into place. 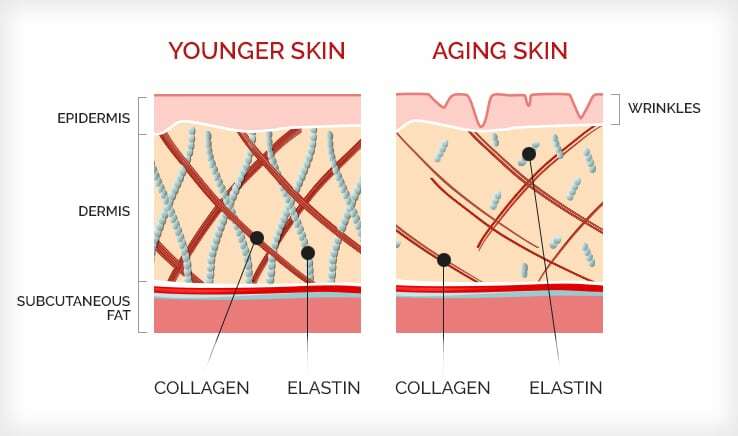 When older skin gets stretched out, it doesn’t spring back into place. However, with the help of anti-aging Genucel products, you can regain some of your skin’s firmness, no matter your age. This loss of firmness is due to several factors that occur simultaneously as we age. Your skin cells are surrounded by microscopic fibers that stretch and pop back into position much like a rubber band. You can see this affect in your skin whenever you stretch it out. These fibers are bundles of proteins, and you can think of them much like tiny rubber bands embedded in your skin that are responsible for your skin’s firmness. As we age, these fibers don’t rejuvenate as quickly. So, like old rubber bands, these older skin fibers lose much of their firmness, and this worsens as we age. As your skin loosens, several signs of aging start to appear, specifically fine lines, wrinkles, puffiness, and bags. This is often complicated by other factors, as well. Because our skin doesn’t move fluid around as efficiently as it did when we were younger, this fluid begins to pool in places such as beneath your eye. Your skin also tends to thin with age. All of these factors must be completely understood for scientists to formulate the Genucel anti-aging creams in such a way they can combat these issues. So, let’s look at a real-world example of how all these various factors start to combine to cause obvious signs of aging. Let’s say that fluid has started to accumulate right under your eyes. The skin is thinner than it once was and the fibers have lost some of their strength. The fluid that would have been pushed through in your younger days starts to press against the looser, thinner skin. As it does so, there’s less resistance resulting in fluid-filled bags under your eyes and puffiness around the corners of your eye causing wrinkles in the skin in that region. Essentially, the same can happen in your eye lids, forehead, jaw line, chin, and neck. This is how you get droopy skin and wrinkles. It’s also how you can get a drooping jawline and a double chin, even if you are normal weight. Over time, the droopiness, puffiness, and wrinkles will usually deepen as all of the factors leading to these conditions continue to get worse. Luckily, the Genucel anti-aging system allows you to intervene and reduce these symptoms of aging which can make you look far younger. Premature aging and normal aging occur when environmental factors like cigarette smoke, industrial pollution, workplace contaminants, or too much exposure to ultraviolet sunlight cause an overabundance of free radicals to form in the body. This is called “oxidative stress.” Free radicals are molecules, most often oxygen molecules, with an unpaired electron which makes them unstable and in search of another electron to bind with. They’ll bind with the first electron they can find, and this causes extensive damage to the DNA and other parts of your skin cells. Antioxidants are substances that fight free radicals. This is why Genucel anti-aging products contain powerful antioxidants like green tea leaf extract and goji berry extract. One of the primary ingredients in the Genucel line of anti-aging products is Eyeseryl. This tetrapeptide is effective at reducing edema, swelling from fluid accumulation around your eyes and on your eyelid. This edema or swelling occurs when fluid starts to pool in congested areas. The areas around your eyes, especially below the eyes tends to be one area of congestion. Edema in the face also occurs when older capillaries start to become “leaky” and more permeable. Eyeseryl helps with this type of edema too and has been found effective in fifteen days or less. Another way that the fibers of your skin cells begin to lose strength is through glycation. This is when a sugar molecule, like glucose, attaches itself to a protein without an enzyme facilitate the process; you don’t want this, and Eyeseryl is effective at preventing this glycation. It should be noted that Genucel anti-aging products, like Genucel Plant Stem Cell Therapy and Genucel XV, contain twice as much Eyeseryl as other anti-aging products on the market. Another primary ingredient in the Genucel anti-aging line of products is PhytoCellTec. These are plant stem cells derived from the Malus domestica plant, a rare Swiss apple. These stem cells causes your skin cell’s fibers to rejuvenate more quickly, strengthening the fibers as well as your skin. Genucel anti-aging products also contain an algal extract that serves as a powerful antioxidant, alongside green tea leaf extract and goji berry extract, that eradicates DNA damaging and cell damaging free radicals. The algal extract is also an anti-inflammatory that protects against the ill effects of any toxins building up in your body’s system. Another interesting ingredient found in Genucel anti-aging is marine collagen, hydrolyzed from the skin, bone, and scales of marine fish. This may sound “icky,” but it makes your skin glow radiantly and has been proven to strengthen your skin. A research study published in 2014 in Skin Pharmacology and Physiology looked into the efficacy of marine collagen. Sixty-nine women, ranging in age from 35-55, were broken into three equal groups. One group received 2.5 grams of marine collagen, another group received 5.0 grams of marine collagen, and a third group received a placebo. To avoid biased results, none of the three groups were told whether or not they were getting the placebo or how much marine collagen they received. They took the marine collagen or placebo for eight consecutive weeks. Both of the groups that received the marine collagen saw improvement in their skin compared to the group that received the placebo. Then, four weeks after the study had ended, the researchers checked the skin of the participants again. The older participants who had received the marine collagen saw even further improvements in the strength of their skin. Most people who purchase Genucel anti-aging products purchase The Genucel System. This system comes with four main anti-aging products, plus your choice of an extra Genucel gift. One of the anti-aging products in this system is called Genucel Immediate Effects. By “immediate,” they mean you apply it and wait only five minutes to see dramatic results. People are often so astonished by the effects of this anti-aging cream that they want the entire Genucel anti-aging system. The Genucel System includes the Genucel XV for reducing facial wrinkles, the Genucel Eyelid Treatment for tightening drooping eyelids, and Genucel Plant Stem Cell Therapy for rejuvenating the cells that produce your skin cell’s fibers. There is new product in the Genucel line called Genucel Jawline Treatment. It combines Meadowfoam seed oil with revitalizing natural peptides to immediately tighten and smooth the skin on the jawline, chin, and neck. No more sagging jaws. The best part is the more you use it, the more effect you’ll see. The Genucel Jawline Treatment can be combined with the Genucel System. In 2006, a study investigated the effectiveness of a Genucel anti-aging cream on wrinkles around the eyes. Twenty women participated, ranging in age from twenty-four to sixty-one. To qualify for the study, the woman had to show signs of fine lines and or wrinkles around their eyes. The women were asked to abstain from using any other creams, lotions, or oils for seventy-two hours prior to the study. During the study, the Genucel anti-aging cream was applied around both the left and right eye and left on for five minutes. Using the established Fitzpatrick Wrinkle Evaluation Scale, ranging from 1 (least visible wrinkles) to 10 (most visible wrinkles), a trained technician evaluated the wrinkles around the women’s eyes before and after the five-minute treatment with Genucel anti-aging cream. In this short time, an average 28.28 percent reduction in fine lines and wrinkles was observed. How does using Genucel anti-aging products compare to plastic surgery? First, applying Genucel anti-aging creams is far simpler, far less invasive, and far less painful than plastic surgery. In fact, while other anti-aging products are widely reported to cause burning when applied around the eyes, or a reddening of the skin, Genucel anti-aging products cause neither of these irritations. Genucel anti-aging creams actually make your skin feel better. Secondly, Genucel anti-aging products are far cheaper than what you would have to pay for plastic surgery. Remember, medical insurance almost never covers cosmetic procedures. According to the American Society of Plastic Surgeons, the average cost to remove bags under your eyes is around $4000 and it can be as high as $7000. The costs for eyelid surgery to eliminate the puffiness of drooping eyelids, also called blepharoplasty, comes with about the same price tag. There are many reasons both men and women want to look younger and why they turn to anti-aging products like Genucel to accomplish this. In many cases, they’re hoping to improve their physical appearance for their significant other. We also all know that dating can be nerve racking enough without worrying about crow’s feet or eye bags. Besides appealing to your partner or a potential partner, a younger looking face when you look in the mirror, or having people compliment you on how you look can be a major confidence booster. Of course, confidence leads to happiness and success in many things. Many professionals use Genucel anti-aging products to help them excel at their work. Melting a decade or two off your appearance can often improve your performance, too. If you’re a doctor, dentist, or lawyer, a younger more vibrant looking face can help you gain the trust of your clients. The same is true with many other professions, especially those where you must interact a lot with other people. Even if it’s subconscious, many clients will respond better to sales people who look younger, more vibrant, and well-kept. – If you smoke or vape, stop. It’s a fact of life, proven by scientists many times over: smokers age much more quickly than non-smokers. – When you go in the sun, especially in the middle of the day when the UV radiation is highest, wear a wide brimmed sun hat to protect your face and neck. Wear long sleeves to protect your arms, or better yet, wear a sun shirt with a UPF rating of 50+ since most clothing materials don’t fully protect you from UV penetration. After smoking, UV radiation has the most devastating effect on the skin. – Take a water bottle with you everywhere you go so you can stay hydrated. If you are not well hydrated, your skin will not fully uptake the Genucel anti-aging creams and you will not receive the full effect. – Lose weight if you are over-weight. Extra weight exacerbates any wrinkles, puffiness, and skin bags. Extra fat fills in and stretches your skin, especially if your skin has lost strength due to aging. Genucel anti-aging creams can help anyone reduce their wrinkles, puffiness, and bags. However, if you are obese, the results may not be as dramatic as someone who is thinner until you lose weight. – Exercise more. You don’t need to join a gym or run a marathon. Simple walking will work just fine. Exercise will also make it easier for you to lose weight if needed. – Consider a facial massage. This will help your body eliminate toxins that can do serious harm to your skin, especially in your face. – Exercise your facial muscles. This may sound strange to you, but even your facial muscles need to be toned. Toned facial muscles will help reduce puffiness and wrinkles. You can find these types of exercises online. They’re actually quite fun to do in front of your children, dogs, or cats because of the funny faces you’ll make. You can even entertain yourself if you do them in front of the mirror. As you’re making these lifestyle changes, be sure to be apply your Genucel anti-aging products on a daily basis. Consistent application is key to keeping the wrinkles and bags away! Just a few years ago, the thought of needing a smart speaker in the home seems liked a major luxury. Now, it just makes sense. Prices have become affordable, and they are capable of doing so many things to make life easier….